Sanchi is situated in the state of Madhya Pradesh in India. It lies at a distance of approximately 52 km from the capital city of Bhopal and 10 km from Vidisha. The major attractions of Sanchi include a number of Buddhist stupas, monasteries, temples and pillars. All these structures date back to somewhere between 3rd century BC and 12th century AD. The Mauryan emperor Ashoka founded all the stupas at Sanchi in the honor of Lord Buddha. They have the distinction of being included by UNESCO in its list of World Heritage Sites. However, the most magnificent as well as the largest one of these is the "Great Stupa of Sanchi". One of the best-preserved stupas, it is also the oldest of the existing structures in India, dating back to the Buddhist period. Encircling the Great Sanchi Stupa is a railing, with four carved gateways, each facing one of the four directions. It is believed that these gateways were carved around 100 AD. All the stupas at Sanchi, Madhya Pradesh, have a unique feature of not having any images of Lord Buddha in human form. Instead, Buddha has been illustrated symbolically, in the form of inanimate figures. The figures include wheels (representing his teaching), his footprints, empty throne etc. However, the figure that is most extensively used consists of a lotus flower. In Buddhism, lotus has a special meaning attached to it. It is both a beautiful decoration as well as a religious symbol. Buddhists believe that, like lotus grows from mud to produce a beautiful white blossom, people can also emerge from the mud of materialism into sunlight. 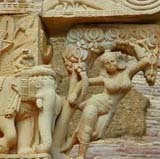 The exquisite carvings on these stupas depict a world where humans and animals live in perfectSanchi harmony with each other. The gateways of all the stupas have carvings that portray a number of incidents from the life of the Buddha as well as his previous incarnations as Bodhisattvas described in Jataka tales. Then, you have the male and female tree spirits adorned on the stupa gateways. The female tree spirits symbolize fertility and are used by Buddhists as welcoming figures. By Air : Bhopal airport is the nearest, situated at a distance of approximately 46 km. By Rail : Nearest railway station is at Vidisha, approximately 10 km from Sanchi. By Road : Sanchi is well connected to Bhopal, Vidisha and Indore through well-laid road network.